Giant WORM Wednesday! "Bobbit Worm" Eunice spp. BIG Raptorial Polychaete videos! I have been running late this week with air travel and various museum starfishy things-but I will have something good soon! I promise.. The Bobbit Dance from Walter Marti on Vimeo. yeah, not echinoderms-but sometimes its good to be diverse, eh? These worms were so named because of their spring-loaded jaws which they used to capture and kill MOVING prey...like FISH. For the sake of reference (size) these get to be over 2 feet (about 60 cm) LONG and can be about 1-1.5 inches (2.5-2.8 cm) in diameter. They get BIG. Bobbit Worm - Dinner time from liquidguru on Vimeo. others... Bobbit worm in slow motion, high definition stock video footage HD 1080p, Lembeh Strait, Indonesia. ECV0006 from Eric Cheng on Vimeo. Bobbit worm at night, high definition stock video footage HD 1080p, Lembeh Strait, Indonesia. ECV0005 from Eric Cheng on Vimeo. this one comes with some an ....overly descriptive intro but has shows some nice behavior.. The Many Colors of Ethanol! Kids and Folk Singin' About Echinoderms! 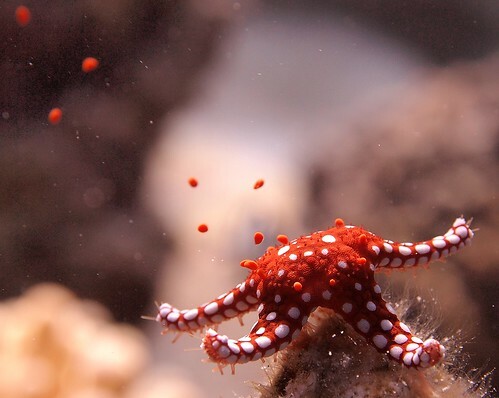 Across the world there's all sorts of people tasked with learning some of the basic important lessons in zoology.. among them, What are echinoderms? Students and educators alike have invoked their MOST creative potential to bring you these incredible SONGS ABOUT ECHINODERMS!! and frankly, they ROCK! Go check em' out! Echinoderms to Justin Bieber's "Baby"
Dr. Dre and ECHINODERMS?? Check it out! Some Cool Chilean (Antarctic) Echinoderm Time Lapse Videos! This week I am doing some museum/starfish related travel. And this one is always a classic! 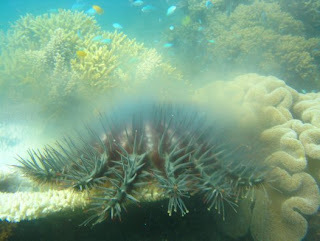 Spiny, Dangerous Sea Urchins and the Fish that Love them! Today, a neat bit of natural history from a short paper by Jon Moore at Florida Atlantic University and Peter Auster at the University of Connecticut published in the Peabody Museum of Natural History 50(2): 381-386 in 2009! The paper is based on submersible (ROV) observations by the authors on three North Atlantic seamounts in the deep-sea (1410 to 1475 meters). The paper highlights an association that you simply wouldn't have seen if you had dredged these up in a net. 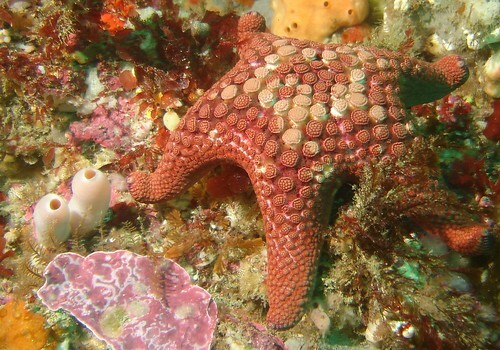 -Body Soft and collapses into flat shape when out of water (hence the term "pancake" urchin). -Very old and were recognized from the fossil record before they were identified from living animals! It turns out that in addition to all of that? Some FISH actually like to live on and around them! Specifically, baby CUSK eels! (family Ophidiidae). This pic shows the juvenile eel identified as Barathrites living in relationship with the echinothurioid urchin Hygrosoma petersi at 1488 m at Yakutat Seamount. 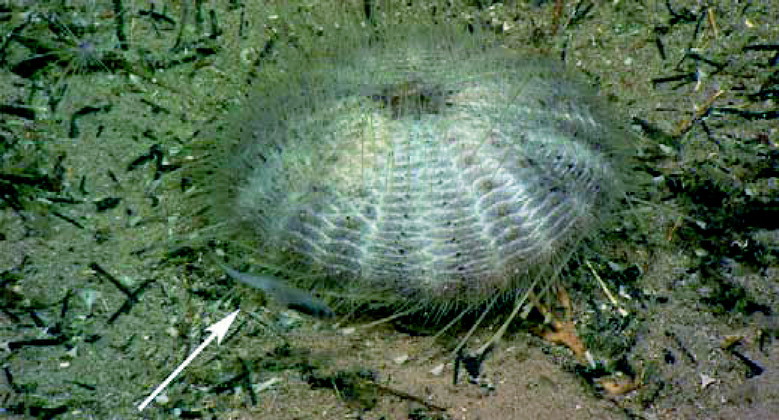 The urchin here is about 17 cm in diameter (fish is about 9 cm long). Usually, these associations were of single eels living in and around the urchins, pecking at food and bits in the sediment-while swimming in and out around the spines and such. 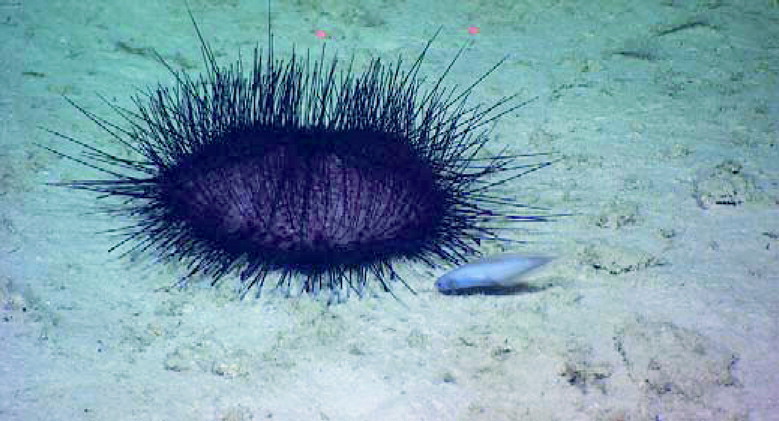 Not every urchin gets some freeloading fish living in and around them! Moore and Auster report that of the 37 urchins they observed, 89% of them (i.e., 33 urchins) did NOT have commensals. However there WERE different taxa that played host to baby cusk eels.. Their figure 4 shows a tiny little fish in association with another genus, Araeosoma fenestratum. Note that this is the proper name for the animal in their Fig. 4! Thanks to Dave Pawson. for the information! Its important to point out that its only the juvenile cusk eels that seem to practice this "hiding among the sea urchins" type of behavior. Adult cusk eels apparently get quite big (62 cm in length! that's about 2 feet long! )..and yeah, no one's seen them hiding behind a 17 cm sea urchin! What's kind of interesting about this behavior is how you see a similar KIND of behavior among completely unrelated fish in shallow water! 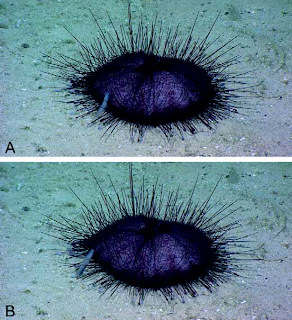 Poisonous sea urchin spines just got that somethin' somethin'!!! To compare, here is Diademichthys lineatus a relatively familiar shallow-water clingfish that lives in and around the spines of the well-known Diadema. How closely associated are these fish? The name "diadem" refers to a spiny crown (i.e., the sea urchin) whereas "ichthys" refers to fish and "lineata" refers to the pattern on the body.. But their name is literally tied to their habitat! According to a paper by Hiroko Sakashita in 1992, which was written about them here the relationship between this shallow-water species and their hosts are a bit more exploitive with juveniles feeding on body parts (pedicellariae and sphaeridia) as well as copepods that also lived as commensals.. So..in both cases..it seems as if the fish get what they will out of it but then "outgrow" their hosts as they mature. Bah! Isn't that just like a fish? 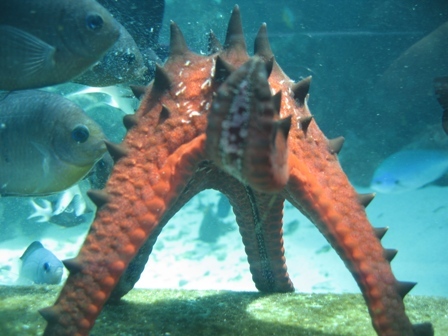 Starfish Standing on their Tippy Toes: The Strangeness of Spawning! How many times in my professional career have I been approached by a diver or some experienced field biologist with a picture of some animal doing an ODD thing. They bring the picture to me and say "By the way, we see this ALL the time. I'm sure its well known". And it turns out, that it is NOT well known but it sure seems like it ought to be known! Why don't we know??? And sometimes they do it en masse! 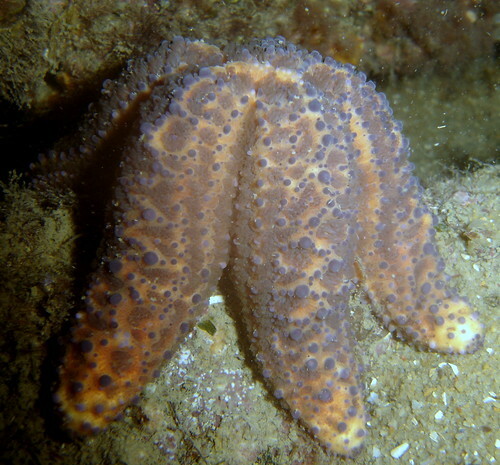 But the behavior is seen in MANY other temperate-cold water North Pacific species including Pisaster ochraceus, and even the large Pycnopodia helianthoides (kind of)! The posture is ALSO seen in tropical species, in addition to Fromia above, we also have examples such as this cushion star, Culcita novaeguineae "standing" up on its arm tips!! and this large multi-rayed Luidia from New Caledonia. Its worth noting that this species is about 1 to 2 feet across! So, one of these standing up is uh...kind of creepy..
AND as long as we are on the topic.. ophiuroids (i.e., brittle stars) ALSO display this behavior! One might ASSUME that it provides a platform for the gametes as they are emitted, higher into the water column. But we actually don't know! What one might infer or assume might not (and sometimes just isn't) the case. People are always surprised when I tell them that. And what seems "obvious" to some people becomes a question once you think about it. 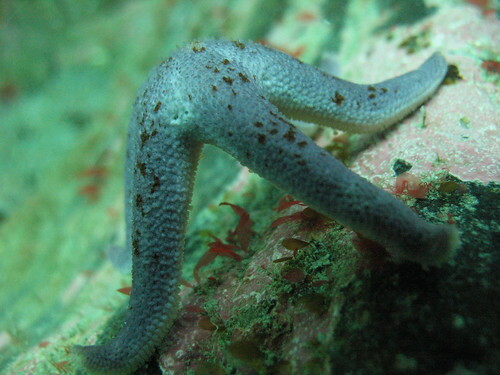 For example, why do sea stars NOT always assume such a posture?? Some species, such as this Australian Acanthaster planci (Crown of Thorns) seem to just go for it without the standing on their toes action! Interestingly there appears to be variation in behavior even within a single species for this behavior! 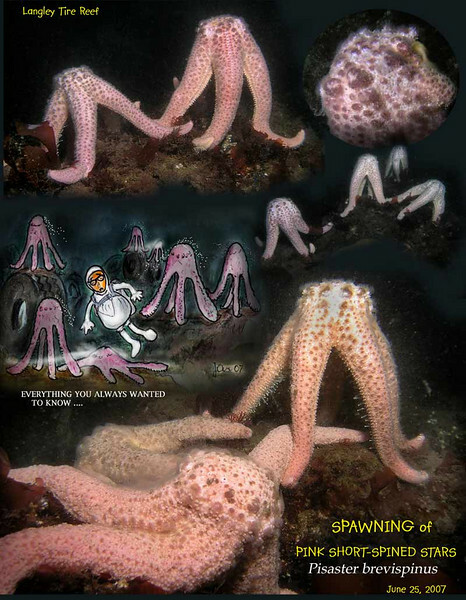 There are a HOST of questions that accompany something as important but as unexplained as these spawning postures! 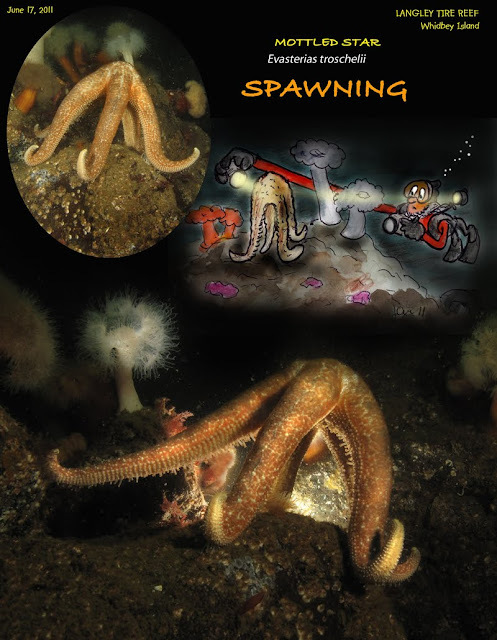 Does the spawning posture maximize reproductive behavior? Why do some species spawn "flat' versus "standing"?? Does the posture relate to the amount of gametes produced? Could this behavior be related to seasonal conditions? Nutrients? Current flow? Does behavior vary in cold versus tropical water species?? Do different species vary in their reproductive posture?? How many species? So to that marine biology student without a project out there reading this in the middle of the night?? You want to travel?? You want to unravel the mysteries of the stars?? 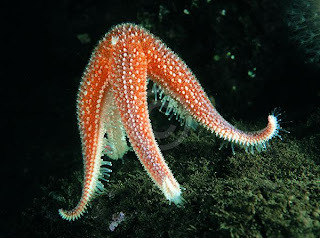 (Well,...sea stars) You want fabulous riches and fame beyond your wildest imaging? And thank me in the Acknowledgments. So Sayeth the Echinoblog !! 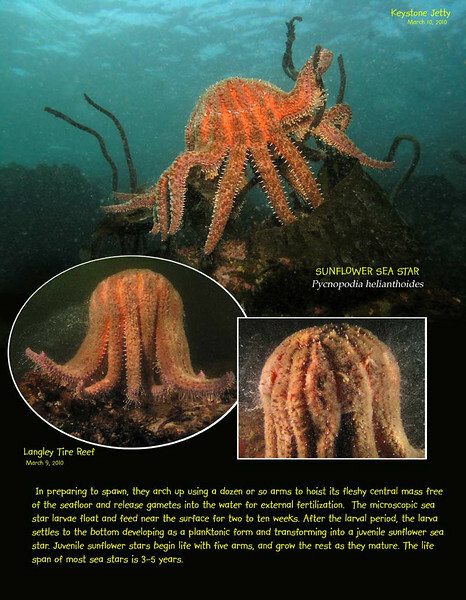 Here are further species documented with this posture...Do you have a picture of a starfish/seastar doing this? Please let me know in the comments! The ophidiasterid Leiaster leachi spawning! another update...May 17, 2013. Linckia spawning..